While intrusion alarms are often considered dumb, many manufacturers are striving to deliver cutting edge technology. As part of this trend, Honeywell has announced the LYNX 5100 Touch, continues its trend of releasing advanced multi-function alarm system components. In this note, we examine the features of this unit, contrasting it to traditional alarm panels and Honeywell's highly self-promoted Tuxedo Touch. 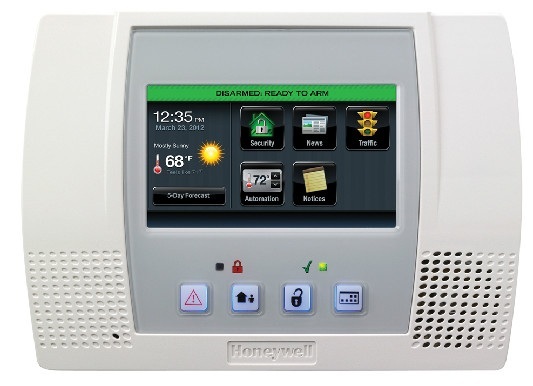 Honeywell aims for the LYNX 5100 Touch to be 'more than just an alarm panel' by making it a central administration hub for a Z-Wave network and Honeywell's 'Total Connect' services platform. The product ships in June 2012 at an estimated street price of $525 USD. While most intrusion alarm systems use separate alarm panels, dialers, and keypads, the LYNX 5100 Touch integrates all of them into a single unit. Displayed Push/Pull content like Weather Alerts, Weather, and Video. Panel radios autosense the best GSM signal, from 2G to 4G: other radios may support only one type of signal, and do not support 4G. Despite these advance features, some limitations exist. For instance, the wireless-only design of the 5100 could constrain some deployments, due to the extra cost and performance limitations of wireless. The 'all-in-one' design tends to limit future system expansion, because the system has a fixed number of alarm zones. However, the LYNX 5100's 64 zones will accommodate most residential deployments. For a complete review of Z-Wave, its features, and limitations, see our recent "Z-Wave Automation Explained" update. The Lynx 5100's 4G support may not be needed for traditional functionality but could enable future video offerings. 4G is largely unneeded for intrusion alarm and home automation function. Those features simply do not take advantage of high transmission speeds or bandwidth. However, 4G support might provide a strong advantage when the Lynx 5100 is deployed with Total Connect services built to stream video. If 4G service is not available, the integrated radio autosenses the strongest class of signal for use. This feature could be useful in areas where GSM coverage is weak or intermittently changes. The panel aims to maintain the 'best' communication option with the central station. Like the Tuxedo Touch, the LYNX 5100 Touch is designed with an integrated WiFi Radio, intended to simplify system wiring and remote access by including WiFi connectivity. The panel itself is not designed to be a 'gateway' device, with direct access to the outside world, but is designed to be easily networked to residential modems for remote access. The panel is also designed to communicate and supervise alarm sensors wirelessly, eliminating the cost and labor of wire runs. This wireless design firmly positions this panel as best applied to residential security, where commercial security typically favors the reliability and performance of wired sensors. The 5100 is likely best positioned for greenfield scenarios where the home is new or does not have an existing intrusion system. The 'all-in-one' design of the 5100 can decrease total cost and the reduced number of devices needed. For expansion or retrofits of existing systems, where panels and dialers already exist, the Tuxedo Touch is likely the better fit given its lower price and less overlap with existing components. In all scenarios, both the Lynx 5100 and the Tuxedo Touch are positioned at the high-end of the residential market for users that want more advanced home automation, video services, etc.